Wow..this is beautiful!What a beautiful garden. 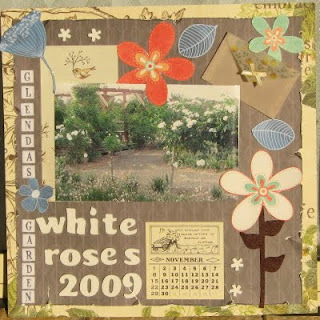 LOve your layout,all the embellies,flowers and the calender!Gorgeous design and I love the white roses! Ooooh I love white roses!! Love how you did this, with the calander and the envelops! Beautiful Garden.... Your layout reminds me of a garden.... So many things to look at. Beautiful. very beautiful page and photo, awesome take on the challenge! Thanks for playing! !